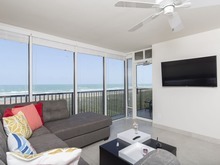 The modern newly remodeled in 2017 “Sea Vista” Beachfront Condo offers 2 Bedrooms, (Sleeps up to 6) 2 Full Baths, 2 Resort Pools (heated in the winter) 2 Hot Tubs, 2 Tennis Courts, Breathtaking Beachfront Balcony, Full Size-Fully Equipped Kitchen, 3 LCD TV’s, Wi-Fi , and so Much More than the Mind Can Conceive! The “Sea Vista” is where the style of Posh, Plush, Lush and Lavish merge to present a great vacation experience! The copious living space in the “Sea Vista” offers the perfect size family vacation getaway. Enjoy your evenings on the private balcony viewing breathtaking sunsets that glisten majestic colors from the Gulf. With the perfect balance of modern amenities and South Padre Island charm the “Sea Vista” is just the right setting for an Elegant Vacation Sanctuary! The “Sea Vista Living Room” is sure to be a favorite with its vast wall-to-wall ocean view that appears to be so close, you feel as though you could easily dip your toes in it right from the living room sofa. The “Sea Vista Living Room” area décor features modern furniture set atop new tiled floor. Accessing the balcony is just a step away. Living room includes a flat screen LCD TV for your family’s evening fun and entertainment bonding time. The “Sea Vista Master Bedroom” offers the view of the ocean and sandy beach are right outside the large open windows and balcony view. Features two new beautifully handcrafted, King size beds, with plush quilts and brand new mattress, attached master bathroom and closet and an LCD TV. The “Sea Vista Bedroom 2” is an adult’s private retreat featuring two full sized beds, newly remodeled bath with granite vanity, a standing shower. Beautiful contemporary furniture and luxurious linens . Enjoy the flat screen TV for night time viewing of your favorite shows.